Update (Oct 16, 2017): Turns out, I’ve been indeed proven wrong! See Robert Hilton’s comment below. There’s a photo in an old Magnetic Signal Company catalog of an overhead, lower quadrant wig-wag in Cordova on page 9. Now I have a plausible reason to build a working wig-wag for the layout. The model CR&NW however, having evolved into a modern heavy ore hauler, would almost certainly have block signals. In my “alternate history” leading to the present day, the railroad underwent extensive modernization and reinvestment in the late 1940s / early 1950s. Radio dispatch (which didn’t become widespread until the 1960s-1970s anyway) would have been nearly impossible, given the remote country and deep canyons traversed by the line. Given a modernization date in the 1940s/1950s, searchlight signals would have been the standard of the day. (Again, looking at the QNSL and QCM, it’s searchlights all around.) The US&S H, H2, H5 and GRS SA were both extremely popular and were the most common type of signal installed all over the US and Canada during the 1940s through about the 1980s. Recently they’ve been falling in record numbers, as their inherently mechanical color changing mechanism (a relay with three small color lenses) requires regular inspection, testing, and maintenance, as opposed to modern three-light heads. The preference for searchlight type signals works out just fine with me, since they’re probably my favorite signal type and they minimize the number of wires or fibers that need to go to each head. 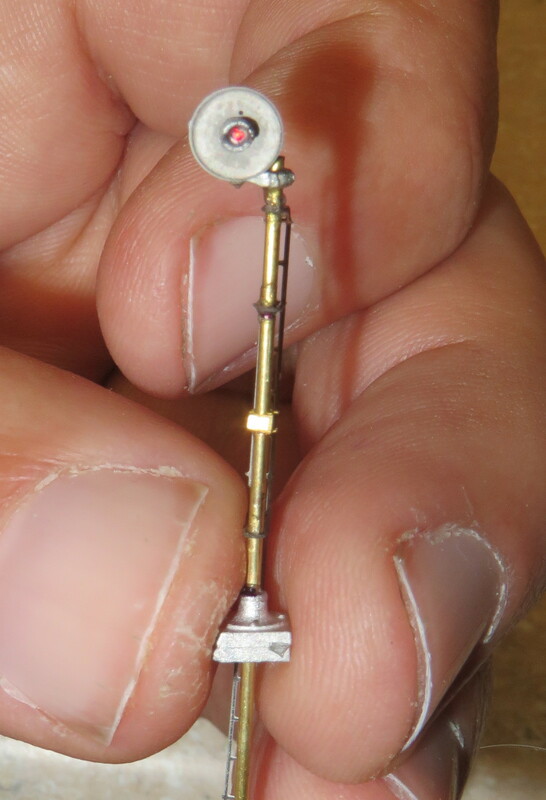 Showcase Miniatures / Century Foundary makes an absolutely beautiful N scale searchlight kit. They’re lit with fiber optics, which allows them to be very accurate in terms of scale. 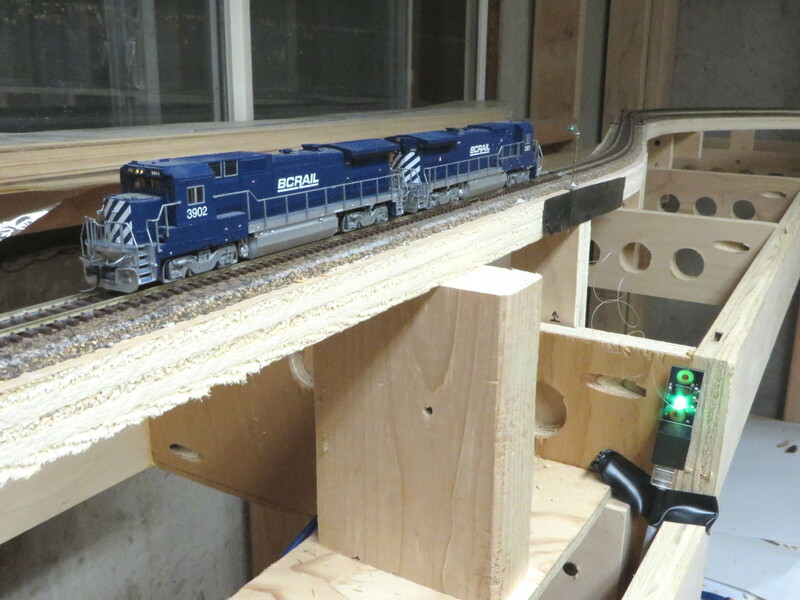 (Oversized N scale signals really, really bug me…) I’d purchased a couple of their kits some time ago, so I pulled one out tonight and built it. It really is a work of art and not nearly as hard to assemble as I’d feared. (I still have some fear of doing a double or triple head…) I didn’t feel like breaking out the airbrush, though, so it’s unpainted for now. The problem is then feeding light into them. Railroad signals have a unique color to them that’s often not captured by LEDs. The AREMA standards (Communications & Signals Manual, section 7.1.10 – “Chromaticity”) require green to be between 498-513nm, yellow to be between 589-597nm, and red to be 627-660nm. Very few 3-color LEDs hit this or even get close, particularly for green. One of the few that gets very close is the Bivar SMP4-SRGY. 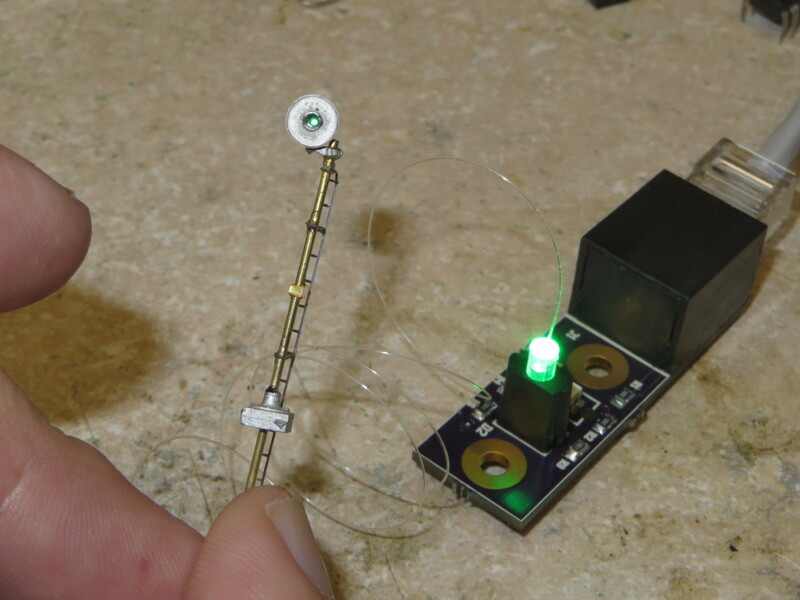 It’s a small PLCC4, with wavelengths of 525nm, 591nm, and 631nm. To my eye, it looks nearly dead on for the prototype colors. 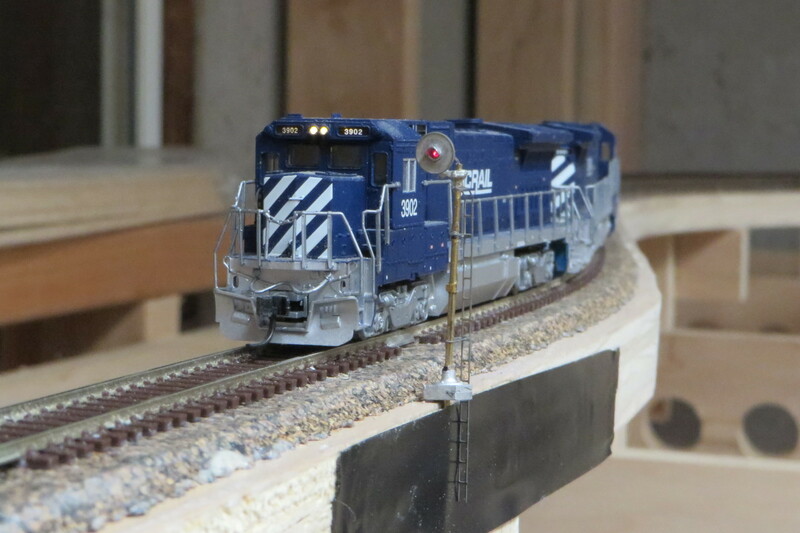 The PLCC4, while fairly small, would still look huge on the head of an N scale signal, and would need four wires running down the mast. So, given that my signal models of choice are based around fiber optics, I created a board with two LEDs on board and holes for clip-in light pipe holders that fit perfectly over the LEDs. (The light pipes are Dialight part 515119200550F if anybody cares.) I can then drill a small hole in the light pipe and glue the fiber into it. 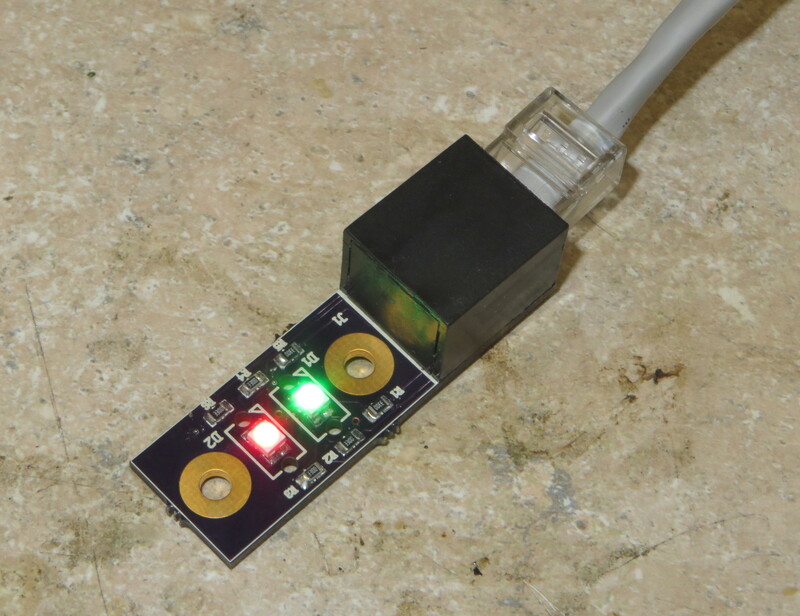 The signal LEDs and their wiring (attached through an RJ45 jack for easy connecting) stay attached to the layout, and the signals can be installed and uninstalled with the ease of just connecting or disconnecting the fiber and light pipe. Given their fragility, the actual signals will be one of the last things installed on the layout. I’ll build some temporaries for initial operations and testing. The LED boards, however, will be installed as part of the signal system. I did a temporary install (using the power of electrical tape to hold up the signal) at one of the block boundaries tonight just to see what it would look like. In the final install, the light pipes will be painted black to eliminate leakage, but as I said earlier – wasn’t in a painting mood tonight. This entry was posted in Alternate History, Electrical on March 26, 2015 by ndholmes. There is a photo of a wigwag on the Copper River & Northwestern Ry. at Cordova on page 9 of “Magnetic Wig Wag Crossing Flagman” (Magnetic Signal Co.), at http://www.rrsignalpix.com/pdf/Magnetic1_ocr_sec.pdf . Robert – Fantastic bit of knowledge! I’ve searched and searched, and never figured out where that reference came from. Now we know. Thank you!